MOSCOW, Idaho – Ed Hall is a walk-on-turned-starter whose dad plays on a reality TV show. Kaden Elliss is a turnover-producing force whose dad starred in the NFL. Tony Lashley, whose position coach says he has a Ray Lewis-like mindset, is Idaho’s leading tackler. These four formed the Vandals’ starting linebacker group the last three regular-season games, and it’s worth remembering their names for a couple of reasons. First, they’re three sophomores and one true freshman (Graham) who are part of promising young core of UI’s defense. More immediately, each of them will play a critical role on Thursday trying to slow down Colorado State’s powerful-of-late offense in the Famous Idaho Potato Bowl at Boise State’s Albertsons Stadium. When the Vandals’ defense has been its best this season – and for stretches, it’s been a lockdown unit – the defensive line has been disruptive. But behind Aikeem Coleman, Tueni Lupeamanu, Glen Antoine and Khalin Smith (who plays a hybrid Buck linebacker/defensive end position), the linebackers are asked to do a lot. Defensive coordinator Mike Breske’s 3-4 defensive scheme demands it of them. Tackling was Breske’s chief concern last week during preparations for CSU because the Vandals haven’t played since Dec. 3. He also knows the Rams like to run between the tackles – and throw play-action passes – more than any team UI has seen this year. Colorado State (7-5, 5-3 Mountain West) averaged 40 points per game while going 4-1 the last month-plus of the season. The Vandals, 8-4 and winners of four straight, have also played their best the last part of the year. They’ve allowed 21.6 points per game in winning five of their last six. Idaho’s defensive improvement has come against a softer part of the schedule, and with the front seven playing at another level. The linebacking unit has been particularly productive. Lashley, a product of historic powerhouse Rockhurst High School in Kansas City, Missouri, leads the Vandals with 99 tackles, 10 for negative yardage. Hall is fourth with 65 tackles. Elliss is tops on the team with three forced fumbles and the co-leader with five interceptions. Graham, a Cheney native, also had a big closing kick to the year. On Nov. 26, he had an interception and sack against South Alabama. He followed that performance with seven tackles in the regular-season finale against Georgia State. Not bad for a 19-year-old who’s listed at 6 feet and 204 pounds. Hall is another unlikely story. His father, Carey, plays on the History Channel’s “Ice Road Truckers,” a series that chronicles long-haul truck drivers who drive across treacherous routes in Alaska and Canada. Carey was working as a trucker in Alaska when he decided to bring his family up from Georgia in 2006. Ed was 10 when he moved to Chugiak, Alaska, just outside of Anchorage. He became intrigued about Idaho once a friend walked on to the football team in 2013 and he discovered UI’s respected mechanical engineering program. He got to Moscow and decided to walk on too. He earned a scholarship, then locked down a starting spot this fall. In addition to playing football and managing the heavy academic load that comes with majoring in mechanical engineering, Hall throws discus for the UI track team in the spring. Hall is another undersized linebacker (6 feet, 212 pounds), but like Graham, he’s athletic and mature for a young player. The same goes for Elliss and Lashley. Elliss is a former high school quarterback from Salt Lake City. He didn’t play linebacker in high school, but after choosing Idaho and grayshirting in 2014, he studied the position religiously with the coaches and his father, Luther, an All-Pro defensive lineman for the Detroit Lions in 1999. Elliss was an instant starter as a grayshirt freshman. 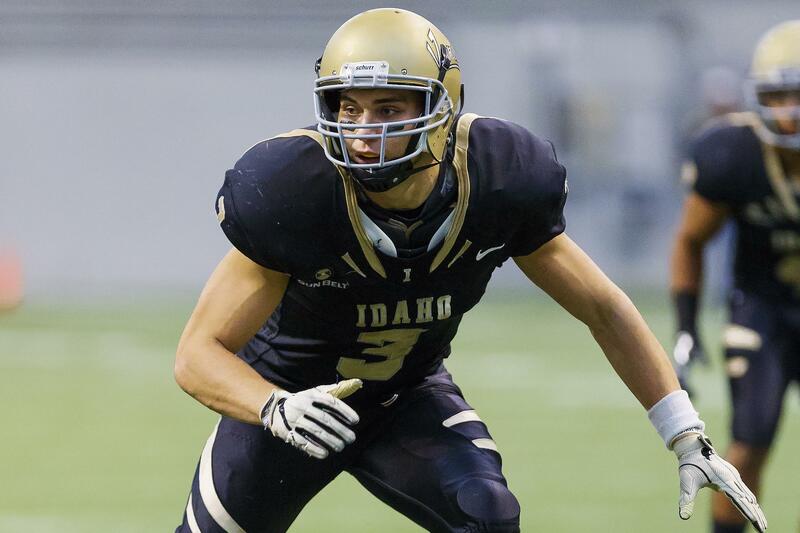 This year he’s developed into Idaho’s best linebacker in coverage. Lashley took longer to develop than Elliss, largely because of injuries. He was forced to redshirt last year after getting hurt early. But in the first game this fall, he had three tackles for loss against Montana State and has collected double-digit tackle totals in four of the last five games. One of Lashley’s trademarks is charging around the corner to wrap up a running back in the backfield, a skill that Brown attributes to his speed and understanding the right angles to take. Published: Dec. 20, 2016, 2 a.m.